Too often, an article will say “drop what you’re doing and watch” or “you have to see this!” I won’t say that. What I will say is that Mike Olbinski has produced yet another spectacular film that is certainly worth six minutes of your time. I honestly can’t remember when it was that I first learned of Mike. Immediately though, I was drawn to his wedding and storm photography – I’ve followed his work ever since. From the few short online conversations I’ve had with him, Mike has struck me as a very genuine and kind person. For me, that’s all that’s really important. It’s one thing to be successful (like having your footage used in a blockbuster Marvel movie), but it’s another to stay down to earth, and to be thankful for your achievements and those that have helped you get there. All sentiment aside, I strongly recommend you click through to the YouTube link for the above video and watch it in its full 4K glory – that is, if your machine can handle it. The footage is amazing, and the soundtrack is the perfect accompaniment to what clearly was an exhilarating storm chase that started in Arizona and traversed 12,000 miles (19,200 km) across Texas, New Mexico, Kansas, Colorado, and six other states. 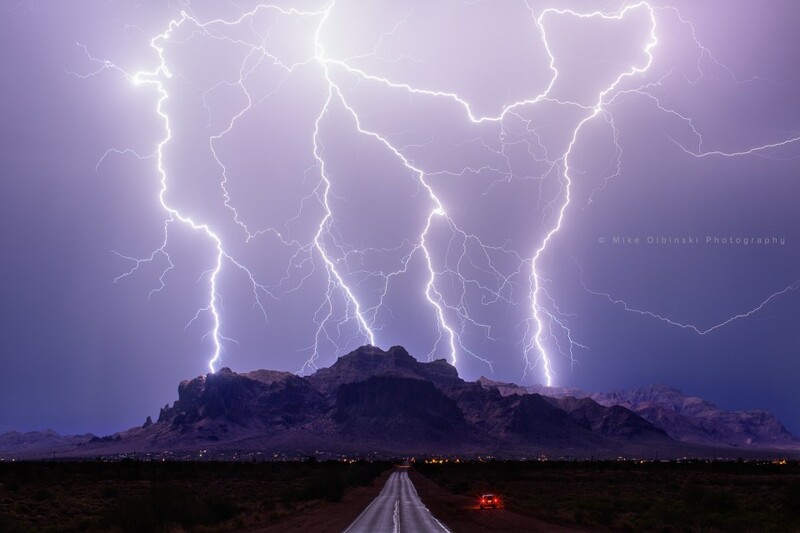 Earlier this month, Mike also published this Superstrike photo over the Superstition Mountains in Arizona. To be honest, it’s easy to run out of adjectives for a photo like this. According to his post, this photo was taken during a single 10-second exposure, without any of that multiple exposure stacking that many storm photographers do. It’s not very often that I purchase prints from other photographers to hang on my wall, usually opting to print and display my own work instead (yeah, I know… I’m selfish). That said, this is a photograph that can easily curb that trend of mine. Superstrike photo and video posted with permission from Mike Olbinski Photography. Previous PostPrevious I Tried UberEATS, and I’ll Do it Again!